This gallery monitors the bloomming period of the Yoshino cherry trees around the Jefferson Memorial in Washington, D.C. The planting of cherry trees originated in 1912 as a gift of friendship to the United States from the people of Japan. In Japan the flowering cherry tree or "Sakura," as it is called by the Japanese people, is one of the most exalted flowering plants. The beauty of the cherry blossom is a potent symbol equated with evanescence of human life and epitomizes the transformations Japanese Culture has undergone through the ages. 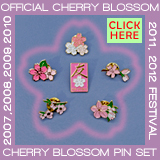 The date when the Yoshino cherry blossoms reach peak bloom varies from year to year, depending on weather conditions. Baby Girl Surrounded by Japanese Cherry Blossoms. It is Lyra Marin's first year to see the cherry blossoms. Second Cherry Tree 2012 Blooming on Tidal Basin. Tuesday, March 13 2012. This cherry tree is just North of Jefferson Memorial. You can see the columns in the background. First, 2012 Cherry Blossoms in Washington, DC. Fri 09 Mar 2012 09:43:52 AM. The first cherry blossoms have bloomed on the North side of the Washington Monument. Southwestern View of cherry blossom indicator tree for National Mall and Memorial Parks. East view of the Washington Monument. Cherry buds are beginning to elongate. This begins the 100 year anniversary of the Cherry Blossoms. 4:20 PM - April 4, 2011. Stunning view of the Washington Monument during the peak blooming period of the 2011 Cherry Blossom season. This year most of the Cherry Blossom Trees bloomed a silky white color. 5:15 PM - April 4, 2011: Warm spring-afternoon view of the Cherry Blossom trees in full bloom around the Tidal Basin with the Washington Monument in the background. 4:14 PM - April 4, 2011. This year the Cherry Blossom Trees are blooming with much more prominent white colored petals compared to the luscious pink. 4:38 PM - April 4, 2011. This young female artist is soaking in the sunshine and creating a beautiful masterpiece of the Cherry Blossom Trees around the Tidal Basin. Cherry Blossoms in full-bloom around the Jefferson Memorial on a gorgeous afternoon along the Tidal Basin in Washington, DC. Tue 06 Apr 2010 04:16:16 PM - April has warmer and drier than normal with little precipitation. Breathtaking view of the Washington Monument surrounded by the pink Cherry Blossoms in Washington, DC.